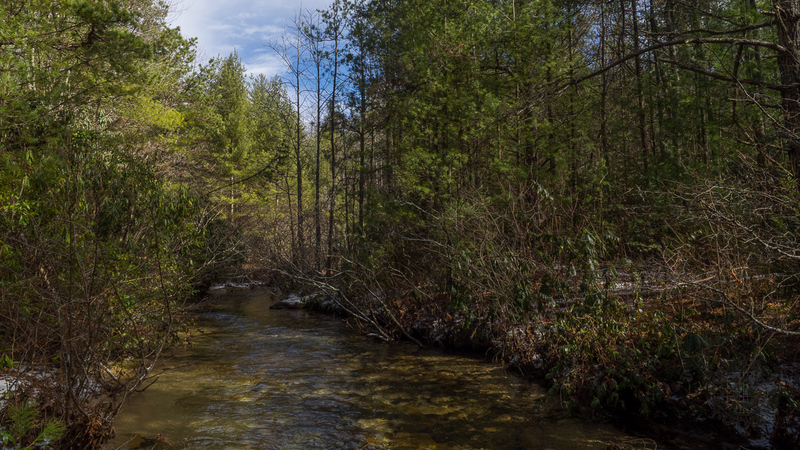 Working on a little project to tick off all the trails within DuPont State Forest, I visited two short ones that are close to each other in the northeast corner off Sky Valley Road. Each is little more than a mile round trip. Flat Rock Trail passes through a boulder field and past a recent logging operation to a dead end at the confluence of Jim Creek with Grassy Creek. Plantation Trail walks among an absolutely stunning pine forest that, judging by all the ribbons tied to trunks, is unfortunately probably next for the lumberjack’s axe. Ken and I hiked these immediately after a brief snow fall on Friday, February 12, 2016 from 11:00AM to 12:45PM. The plan was to take Flat Rock Trail out and back, then drive the two miles to Plantation Trail for the same. Hike Rating: Easy. Both trails are short and level. Trail Condition: Very good. Flat Rock Trail is a touch uneven, but Plantation is an excellent soft bed of pine needles. Starting Point: Two trailheads on the far northeastern end of Sky Valley Road. Trail Traffic: We encountered two other hikers on Plantation Trail, none on Flat Rock. How to Get There: DuPont State Forest can be accessed from Hendersonville via Kanuga/Crab Creek Rd., from Asheville/Brevard via US64 and Little River Rd., or from Greenville, SC via Cedar Mountain and Cascade Lake Rd. Sky Valley Road off Staton Road takes you to the trailheads. As I was approaching DuPont State Forest from the north on Crab Creek Road, I could see a fresh powdering of snow on Stone Mountain. Since I was heading to that general area of the forest, my anticipation filled with the possibility of white trailheads on Sky Valley Road. To get to Flat Rock Trail take Sky Valley Road past Guion Farm, then up the steep hairpin climb to the top of the ridge. The trailhead is on the right, with barely enough room for two cars off the side of the road. Sure enough, when I arrived at the Flat Rock trailhead there was still a light dusting of snow on the trail and the pine boughs. The trailhead is marked with an old culvert drain pipe, kind of an unusual designator, but I suspect it’s an effort to keep wheeled vehicles off the path. As I proceeded a couple hundred yards into the forest, there was a boulder field strewn about. Car sized rocks were half buried and half exposed as if blasted from a volcano eons ago. Unlike what I would find later, the forest is rather thin here as if selective logging has occurred in the past. 10 minutes later there was more definitive proof of logging, this time clear cut. On the left of the trail is a stripe through the pine forest about 30-40 yards wide where everything but the stumps has been removed. I know that one of the purposes of DuPont State Forest is timber management, including pine harvest, but it’s still sad when you happen upon a decimated grove. The Flat Rock Trail makes a very gradual decline as it approaches Grassy Creek. You begin to hear it on your left, then suddenly it is upon you straight ahead. Where the trail meets the creek is a dead end. Jim Creek comes in from the north to meet Grassy Creek right here at the terminus. The creek bank consists of a very fine tan colored sand that on this morning was still frozen. The creek bed is filled with multi-colored cobblestones that glimmer and glint in the sunlight. On the right side of the trail I saw evidence of a game path that followed Grassy Creek, so I did too. I was able to continue another couple hundred feet before being swallowed by the ubiquitous Carolina rhododendron. This is upstream along the game trail that parallels Grassy Creek. Looking at the azure sky it’s hard to believe a snow squall came through just a couple hours before. I stayed for 10 minutes to enjoy the crystal clear water of Grassy Creek then made my way back to the trailhead. I got back in my car and continued farther up Sky Valley Road, perhaps another two miles, where I met my usual hiking partner Ken. The sign for the Plantation trailhead is kind of hidden by vegetation along the roadside, so keep your eyes peeled. It became obvious almost immediately that the white pine forest surrounding Plantation Trail is mature. These trees have been here for quite awhile, some standing 60-70 feet above the forest floor. The understory itself is awash with new growth… hundreds of new pines standing 10-18 inches. So you can imagine our discouragement a little while later when we noticed the tell-tale ribbons tied around nearly every tree beside the trail. It has been my experience in other forests that ribbons mean logging. These are the chosen. It is likely that sometime in the next couple years the loggers will come… and what a shame. This plantation forest is absolutely stunning. The photo at the top of this post offers an example. Hopefully the N.C. Forestry Service will sparingly harvest here. The southern end of Plantation Trail makes a kind of lasso loop. We chose to take it clockwise. Soon after there was a log with our name on it and we stopped for lunch. The woodland was nearly silent, interrupted only by the breeze and the occasional squeaking of two trees rubbing together in the wind. The air had quickly warmed, melting all the remaining snow, although it isn’t likely much found the ground here because of the dense tree tops. Resuming our hike, the path became surrounded by rhododendron and mountain laurel, almost swallowing us. As we snaked our way through, we happened upon a young couple out enjoying the woods like us, the only other folks we would see. Summarizing, these two trails in the northeast corner of DuPont are ideal for beginning hikers. Maybe you aren’t in the best of shape. Perhaps you’re recovering from an injury. Maybe you’re looking to take your toddlers along. Both trails are extremely easy and short. Since they are separated by only a couple miles on Sky Valley Road, you to do both in a single morning. So, if you’re looking for a gentle stroll through beautiful pine forest, this may be just the ticket. If you’re looking for more, there are other trails located between these two that offer more of a strenuous challenge including Stone Mountain. Throw that one into the mix as well. Updated February 1, 2017: As mentioned above, there were a number of ribbons on the stately pines along the Plantation Trail, usually a harbinger of timber harvesting. Since our last visit nearly a year ago, the loggers have indeed been busy. It is not a clear cut, but the loggers are taking a fair amount of this forest. It is still in process, so the post harvest remediation work has not yet begun. Following are a few pictures showing how this forest is changing. I will leave it to you to decide if it is for the good.